Scandic Hønefoss is located in the centre of Hønefoss. 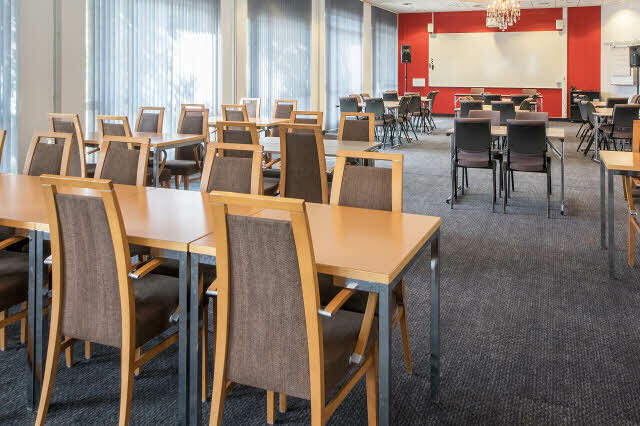 Our hotel is located 60 minutes from Oslo airport Gardermoen, and offers great connections with the airport bus. It takes 50 minutes by car from our hotel to Oslo. We tailor meetings and conferences according to your needs. ​Our​ hotel offers 82 rooms with space for over 150 people. We have a great fitness room that our guests can use free of charge. Enjoy an evening meal in our hotel bar. Our bar serves all kinds of drinks and has a new billiard table for our guests. A small outdoor terrace is located next to the main entrance. We have a personal trainer, and offer yoga-pilates classes on request. Storøya Golfklubb is located 20 minutes from our hotel by car. Ringeriksbadet is a smart pool, only 10 minutes from our hotel. Ringerike Museum and Kuben shopping centre are just around the corner. Our hotel is located in the centre of Honefoss. The city’s shopping street is located right outside our hotel. A few minutes’ walk away, you’ll find green parks and Honefossen waterfall. Our breakfast buffet is served from 06:30 in the morning in a welcoming setting. In addition, we offer a meeting lunch and a meeting dinner. We have capacity for 140 conference guests in one room. You can book meeting rooms for 2–140 people at our hotel. We’ll organise your meeting according to your needs. We have 5 newly refurbished meeting rooms with large windows. Our meeting rooms are right next to the lobby, and the transition from meeting to socialising is just a few steps away. In addition we have 4 group rooms.